This summer, renovations have been wrapping up at South Quad, the new Munger graduate residence is rising higher, and West Quad is closed for a complete renovation. When you visit campus, you will undoubtedly notice some construction fencing! 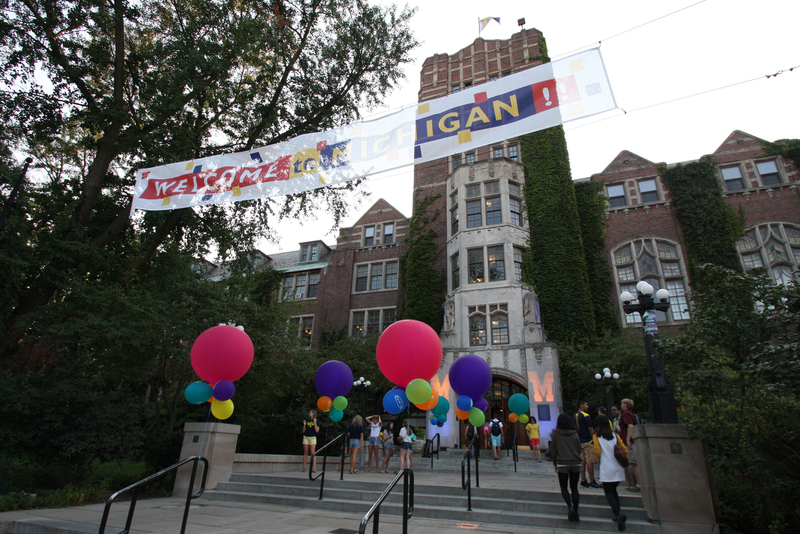 In the heart of all this exciting activity, the Michigan Union’s operations and hours of service remain in full swing. From morning to evening, the Union continues to offer a variety of shops and stores for tasty meals, snacks, coffee breaks, banking and other conveniences for visitors to the campus community. And the Campus Information Center on the first floor is a helpful resource to make the most of your visit. Stop in to browse spirit wear, books and supplies at Barnes & Noble or check out software deals at U-M's Computer Showcase. Or simply refresh at one of many cafes and restaurants located on the ground and first floors. Throughout the building, computer stations and free wi-fi can keep you connected to the world beyond campus. And for a taste of Michigan history, visit the north stairwell and explore significant happenings at the Union over its nearly 100 years as a center of student life. As always, the Michigan Union will be ready and eager to serve students and their families whenever you're on campus.